I'm in love with these.. totally glad I decided to splurge, even my guests are in love when i serve them a frozen drink! This set of six attractive glasses from Mexico's Javier and Efren are ideal for serving refreshing pina coladas. 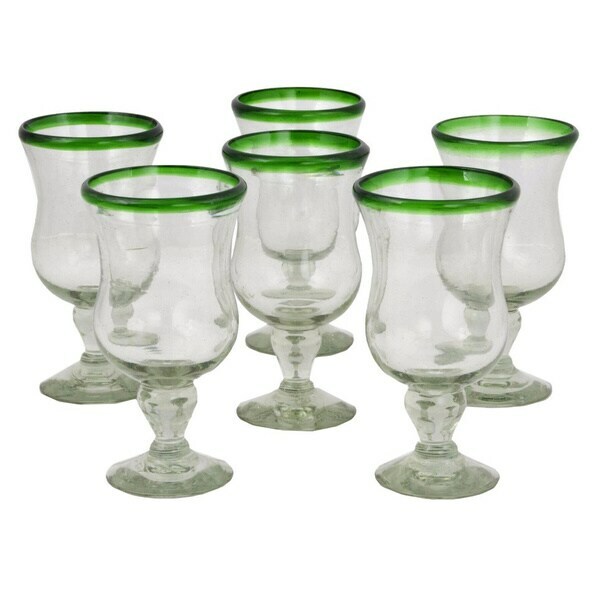 This set of glasses is hand blown and features a green rim. "Since the 1990s, Javier and Efren have worked together to preserve Mexico's blown glass artistry. Even though the art of blowing glass originally came to Mexico from Spain, and it is practiced all over the world, Mexico's blown glass artistry is unique. Working as a team, Javier specializes in the design of the pieces, and Efren transforms the designs into a reality. The artisan holds molten glass with one end of a steel pipe and blows through the other end. The glass is shaped by hand before it cools." We love these glasses! They are a little heavy but what man would complain about that? They look great and we use them every day for milk & tea, and occasionally for something more interesting! I was pleased with these glasses as they look exactly like the advertised photos. They were packaged very well.